Our Punter of the Week is KW, from Melbourne, who walked away nearly $2,000 richer after a simple race-to-race treble on Saturday afternoon. Kicking things off on the Gold Coast, our punter watched on as Ryan Plumb drove hotpot Aggravate to the lead from an inside draw in the Pink Ribbon Cup and controlled the race thereafter, holding a 2 ¼ length margin on the line with a fairly soft win. Then it was down to Sydney for the feature event at Rosehill, the Golden Rose, where our punter sided with Chris Waller’s The Autumn Sun. Settling at the rear of the field, the JJ Atkins winner proved his class by overwhelming stablemate Zousain inside the final 100m. Landing in Perth for the final leg, KW saw another odds-on shot in Rockon Tommy wear down leader Red Paddy to score his fourth win at Belmont and complete the bet. Not bad for 20 minutes work! 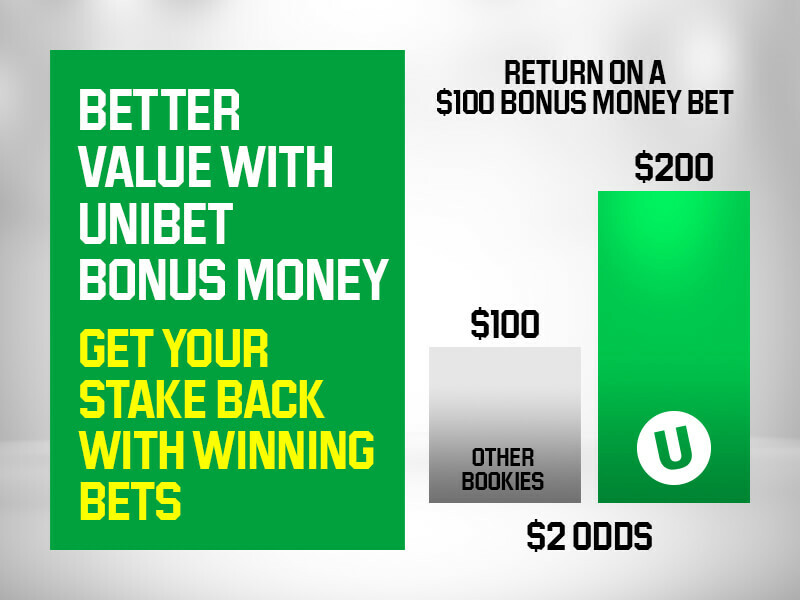 Unibet Bonus Money includes your stake in winning Bonus bets - unlike other bookmakers who like to take it away! You can also 'split-up' your Bonus into individual bets. * Turnover requirements may apply (on Bonus amount, NOT winnings). Copyright 2019, Unibet All rights reserved. Unibet Promotions Terms & Conditions : NSW, WA and SA residents are unable to participate in Unibet promotional offers. Residents of VIC and QLD may be ineligible to participate in Sign Up promotions and some other promotional offers, unless they opened their account prior to receiving notice of the promotion or prior to the promotion being advertised (whichever occurs first). Please check the specific terms of each promotion for details . Click here to view full promotions Terms and Conditions. “UNIBET” is a registered trademark. Unibet is not affiliated or connected with sports teams, event organizers or players displayed in its websites. This website is operated by Unibet/Betchoice Corporation Pty Ltd. ABN 71 121 382 607 , whose registered office is Fannie Bay Racecourse, Dickward Drive, FANNIE BAY NT 0820 Licensed and regulated by Australia's Northern Territory Government. Think! About your choices: Freecall 1800 633 635 G-Line (NSW), a confidential, anonymous and free counselling service.